Just looking at recent green job ads can be an inspiring experience. In these listings, prospective job candidates have the chance to work on everything from on-site monitoring of environmental impacts to program development and sustainability training. These roles clearly require creativity, environmental expertise and effective problem-solving – a dream come true for talented professionals who want to make a difference in their communities. Few people would argue that there aren’t some great opportunities out there. The real issue is about knowing how to prepare effectively for these new green careers. 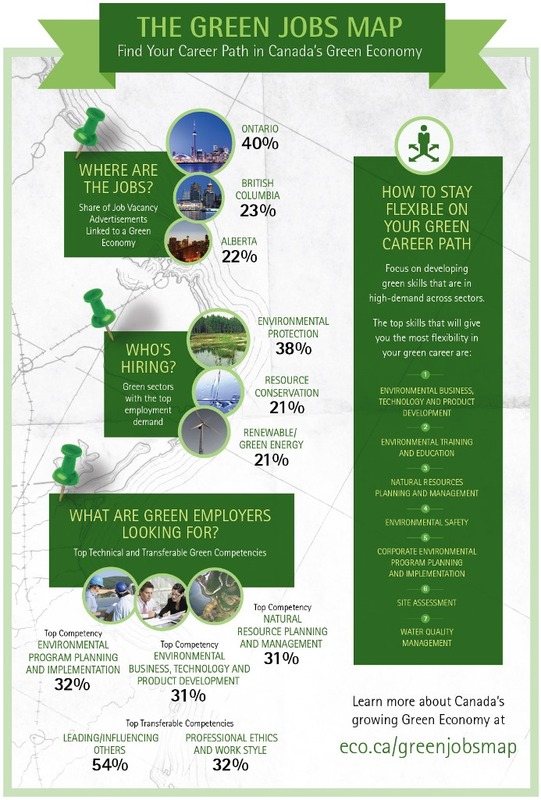 To bridge a long-standing informational gap on green employment trends, The Green Jobs Map – Tracking Employment through Canada’s Green Economy examined top green job opportunities. We designed these research findings to meet the needs of a career map, with clear guidance on how and where to find the best green job options. Since nothing communicates an idea quite so effectively as a picture, check out our infographic of the report’s top results below!